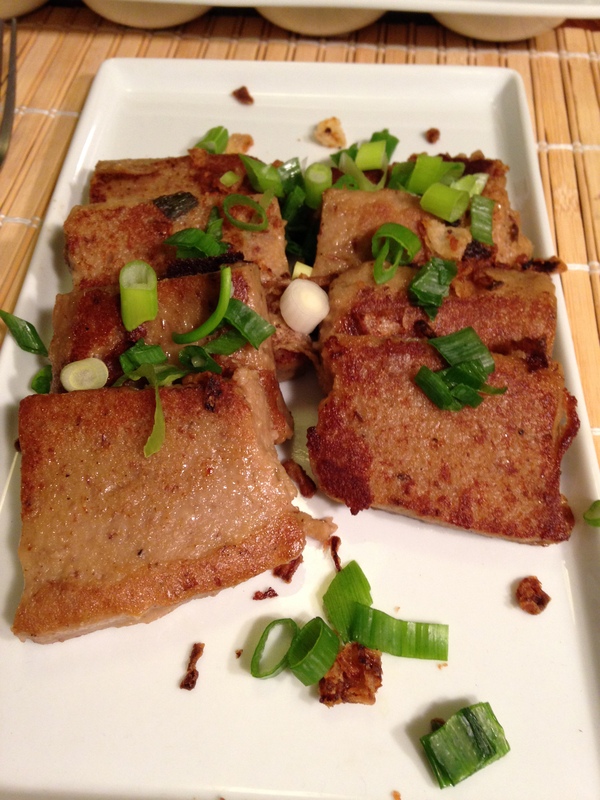 Turnip Cake with Daikon radish, tapioca flour instead of rice, fried onions, scalions, served with fig oyster dipping sauce. 1. Steam bacon till soft and juicy, then stir fry: cut bacon into 3-4 equal sized pieces, place into a shallow heatproof bowl or tupperware. Bring water to a boil inside covered steamer and place bowl inside steamer without touching walls). Cover, reduce heat to medium, steam until bacon is softened and there are juices in the bowl, ~15 minutes. Set aside bowl to cool. After cooled, cut off the thick layer of fat with rind, then chop in fine bits. Then fry for 3 minutes in a wok until starting to brown. Add rice wine, sugar, bacon juices from pan and bowl, and combine. If you do not have bacon, you can just make it without bacon but add 3 tsp soy sauce to the final mixture. 3. Prepare mushrooms and shrimp: After mushrooms are soaked, drain and save liquid, cut off and discard stems, mince caps. Soak dried shrimp in 1/2 cup cold water 30 minutes while daikon is cooking, then minced the shrimp. 4. Mix is all together: Mix the drained daikon, bacon and mushroom in the saucepan. Mix the rice flour or tapioca with mushroom and shrimp soaking liquids and stir together until smooth, also stirring in 1 cup of the hot daikon broth. Mix the batter into the saucepan and add salt. It should be the consistency of rice pudding. Pour into a heatproof container/bowl such a loaf pan or souffle dish. 5. Steam the pan or dish with batter for 1 hour (making sure dish does not touch sides of steamer), until cake has set and is relatively firm to touch. Allow to cool for ~30min-1h and then cover and refrigerate at least 3 hours. it will firm up more in the fridge. 6. Unmold: Use a knife along the edge of cake to loosen sides and then invert onto a cutting board. Cut into 1/2 inch thick slices. 8. Eat: Top with scallions and fried onions, and serve with oyster sauce alone or a mix of oyster sauce and fig chutney.